URUMQI — The first time we boarded the bright orange articulated Line 3 buses of this desert city’s year-old Bus Rapid Transit network, we got lost. As an American writer intensely interested in new forms of urban transportation I assumed that the BRT system here was like the ones I’d ridden in Cleveland and Pittsburgh — a single line delivering passengers point to point. Wrong. 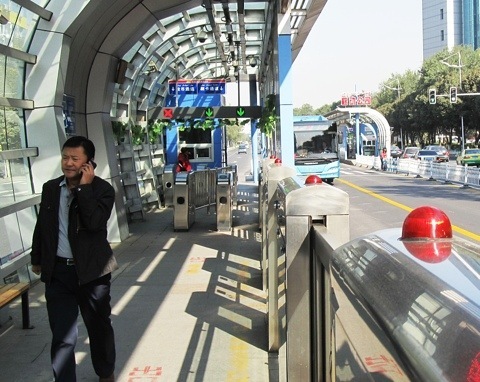 Last year Urumqi opened China’s newest, and one of its most expansive BRT systems. There are three interconnected lines, spanning 42 kilometers and 55 station stops, that encompass much of this restless city, a 24-hour swarm of cars in crowded streets. We backtracked that first day, and ended up taking a cab a short ride to the hotel. Every other time we rode the BRT, for 1 RMB or just over 16 cents a ride, we hit every station we needed to. Ever since Curitiba, Brazil opened the world’s first BRT system in 1974, Bus Rapid Transit has been installed in over 100 cities worldwide. There are 30 lines now in 19 U.S. states, and many more are planned or under construction, including a 9.6-mile line in Grand Rapids, Michigan. Here in China, though, cities didn’t just build single lines; they built BRT networks. Freed from the democratic give and take of debate about costs and subsidies and NIMBYism and all manner of other impediments characteristic of transit planning in the United States, China pressed ahead with some of the best BRT systems in the world. Since the first Chinese BRT network was opened in Kunming in 1999, China built 13 others, including the newest and one of the largest here. 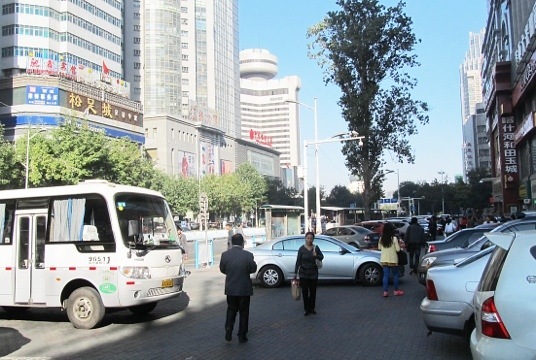 Urumqi, like other Chinese cities expanding at rates never before seen in history, needed no other justification for its BRT system other than as a new means for moving people around a modernizing city smothered in traffic. City planners, apparently anticipating BRT, designed major tree-shaded avenues that are eight to 12 lanes wide. The two center lanes, dedicated solely to buses, are separated from the others by white metal barriers. Modern glass and stainless steel station stops are spread about every half-kilometer. Buses are so numerous the wait time typically is less than a minute. There is really nothing rapid about buses that move at a top speed of about 55 kilometers an hour. But because of the startling levels of traffic day and night the BRT delivered us to destinations at least as fast, and often significantly more quickly than riding in a taxi. What also intrigued me about the BRT system here was how it exemplified the modest but still gathering momentum of Urumqi’s work to be more innovative in contending with the limits to its development, particularly those that focus on the contest between the rapidly expanding population and industrial sectors, and the tight water supplies and filthy air. I’ll write more about this in our upcoming reports at Circle of Blue, but suffice to say that in few other places outside China are cities expanding like they are here. Urumqi’s growth is near the top of the chart. Since 2000, when the population was 1.78 million, Urumqi added nearly 70,000 residents a year, reaching an estimated 2.6 million residents this year. There may be 1 million more migrant laborers living in the city, according to municipal estimates. If Urumqi was in the United States it would be the country’s third largest city, right behind Los Angeles. The same sort of steep growth vector describes the development of Urumqi’s industrial and manufacturing plants, which consume immense amounts of energy. Last year, Urumqi’s electrical generating stations burned 19.4 million metric tons of coal, over three times more than in 2000. That’s almost as much coal, to power one city as Ohio, the eighth largest coal producing U.S. state, mined in 2011. The dirty air here, which obscures the snow peaks at this city’s front door and coats buildings and sidewalks in greasy black dust, is the result of all that coal combustion, university ecologists said. Yet traffic and air pollution are lower priorities than this dry city’s big resource limit – the finite water supply. A water specialist at the Xinjiang Institute of Ecology and Geography told me that climate change is prompting the mountain snows in the Tianshan Mountains to recede. The glacier that provides much of the city’s water is retreating. Urumqi recycles a good deal of its wastewater for industrial uses and to water parks and gardens. But the city’s water consumption, 310 million cubic meters last year (819 billion gallons), is twice as high as it was in 2000. The solution: some combination of improved energy efficiency, restrictions on industries that use huge quantities of water, new air pollution control equipment, fuel switching to cleaner power sources, managing population growth, and more thoughtful transportation options and land use patterns to convince people to get out of their cars. That’s why Urumqi’s new BRT system attracted my attention. In a city so determined to grow, it’s a step toward thinking more carefully about how to accomplish that feat without wrecking the place.